QUESTION: WHEN WILL VOTERS CONSIDER APPROVING THE AMENDED UTILITY USERS TAX? Answer: Voters will consider approving the amended Utility Users Tax at the November 4, 2014 election. QUESTION: WHAT IS THE UTILITY USERS TAX? 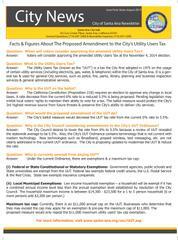 Answer: The Utility Users Tax (known as the “UUT”) is a tax the City first adopted in 1975 on the usage of certain utility services (including electricity, gas, water, & telephone) within the City of Santa Ana. It is a general tax & used for general City services, such as police, fire, parks, library, planning and business inspection services & general administrative services. QUESTION: WHY IS THE UUT ON THE BALLOT? Answer: The California Constitution (Proposition 218) requires an election to approve any change in local taxes. A rate decrease from the current 6% rate to a reduced 5.5% is being proposed. Pending legislation may inhibit local voters’ rights to maintain their ability to vote for a tax. The ballot measure would protect the City’s 3rd highest revenue source from future threats & preserve the City’s ability to deliver city services. QUESTION: WHAT WOULD THE PROPOSED AMENDMENT OF THE UUT DO? Answer: The City’s ballot measure would decrease the UUT tax rate from the current 6% rate to 5.5%. Question: Why is the City Council considering amendments to the City’s UUT Ordinance? Answer: The City Council desires to lower the rate from 6% to 5.5% because a review of UUT revealed the statewide average to be 5.5%. Also, the City’s UUT Ordinance contains terminology that is not current with modern technology. New technologies such as Broadband, prepaid wireless, text messaging, etc. are not clearly addressed in the current UUT ordinance. The City is proposing updates to modernize the UUT & reduce the rate. QUESTION: WHO IS CURRENTLY EXEMPT FROM PAYING UUT? (i) Federal or State Constitutional or Statutory Exemptions: Government agencies, public schools and State universities are exempt from the UUT. Federal law exempts federal credit unions, the U.S. Postal Service & the Red Cross. State law exempts insurance companies. Maximum tax cap: Currently, there is an $11,000 annual cap on the UUT. Businesses who determine that they may exceed the cap may apply for an exemption & pre-pay the maximum cap of $11,000. The proposed measure would only repeal the $11,000 maximum utility users’ tax cap exemption.